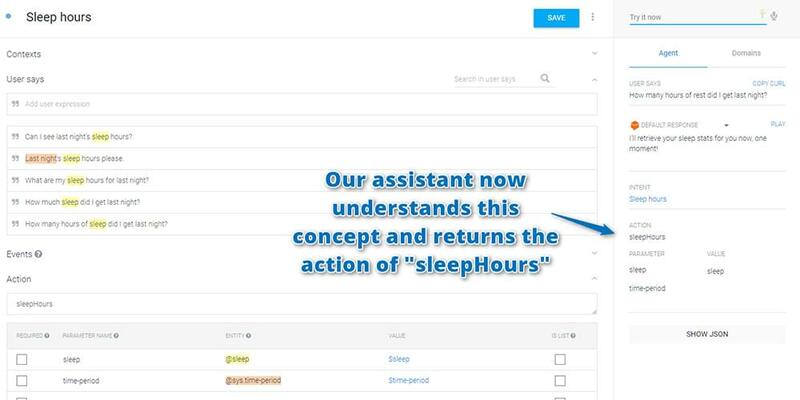 Here at SitePoint, we’ve looked at the basics of setting up your own personal assistant using Api.ai and delved further into intents and context. In this article, you’ll be going one step further in the process, teaching your assistants completely custom concepts using Api.ai entities. 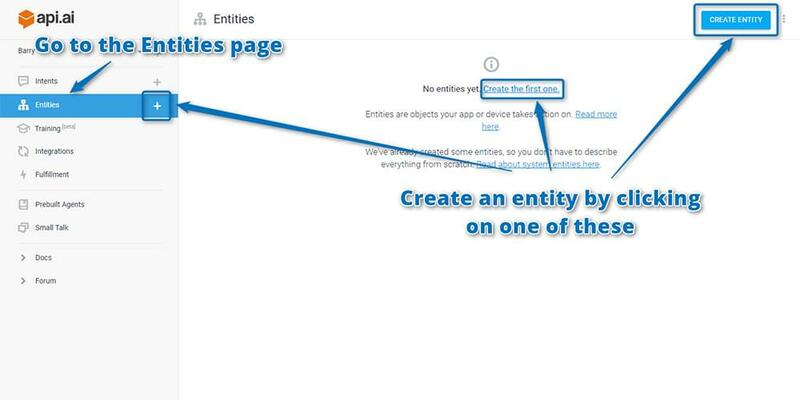 An entity is a concept you want your personal assistant to understand when it’s mentioned by the user in conversation. Each entity has a range of values and properties that contain the terms the assistant will need to understand to respond to this concept. System: Entity types defined by Api.ai such as date, color, email, number and so on, which Api.ai already understands. You can find a full list of these entities in Api.ai’s documentation on System Entities. Developer: Entities which we create for our individual needs. These are what you’ll be focused on in this article. User: These are created for individual users while they use the assistant and can be generated by the Api.ai API to be used within a single session. I won’t be covering these in this article, but if there’s enough reader interest, I might explore this in future! Api.ai’s small talk is an example of a range of statements with no entities whatsoever. They’re listening for statements whose meaning doesn’t change based on keywords in the sentence. When someone asks “How are you?”, there’s no variation Api.ai understands. However, if we adjusted that to “How is Jimmy Olsen?”, we’re moving this sentence into the realm of entities. “Jimmy Olsen” would be an entity that represents a person. Teaching your agent that entity would mean if someone asks “How is Bruce Wayne?”, your agent would know that they mean to ask how a person is, and that they want to know about Bruce Wayne specifically. As another example, an entity of “superhero” is not something Api.ai knows about. You could train your assistant to understand a range of superheroes and their various names — “Superman”, “Batman”, “The Flash”, “Green Lantern”, “Wonder Woman”, “Santa” and so on. It could then understand that these are specific concepts you want to trigger actions with, such as contacting these heroes when villains strike via an API when you say things like “We need The Flash!”. You can also teach your assistant synonyms for each of these, so that alongside names like “Superman”, it would also understand that Superman is also known as “Kal-El”, “The Man of Steel”, “Supes” and “Smallville”. If you say a different name in the spur of the moment (or someone else tries to request help from your assistant and they call them something else), help from your hero will still come! 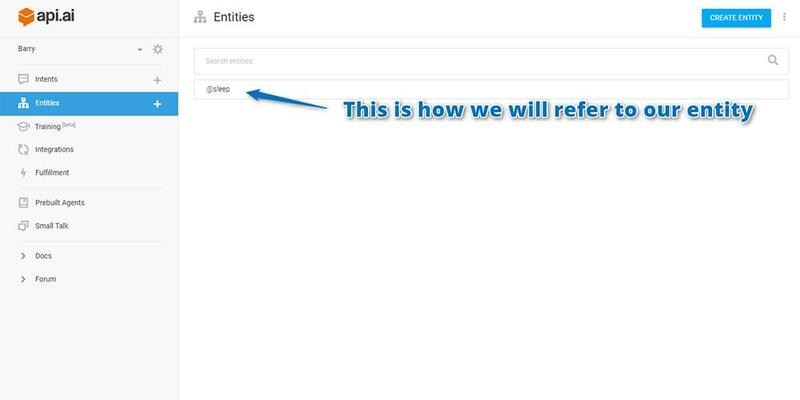 In this article, I’ll look at the first step of this process — setting up the entities required for your assistant to understand these statements. In the next article in this series, I’ll look at connecting up your assistant web app to third party APIs to give it the information it needs to respond. 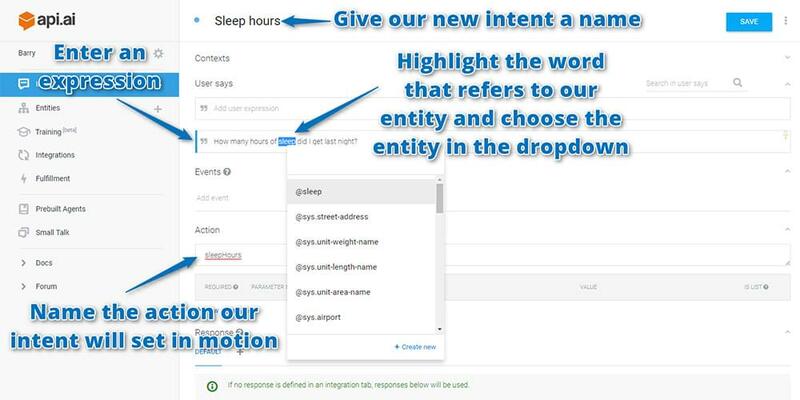 If you return to the “Entities” page, your new entity is shown with the name you’ll use to access it — @sleep. 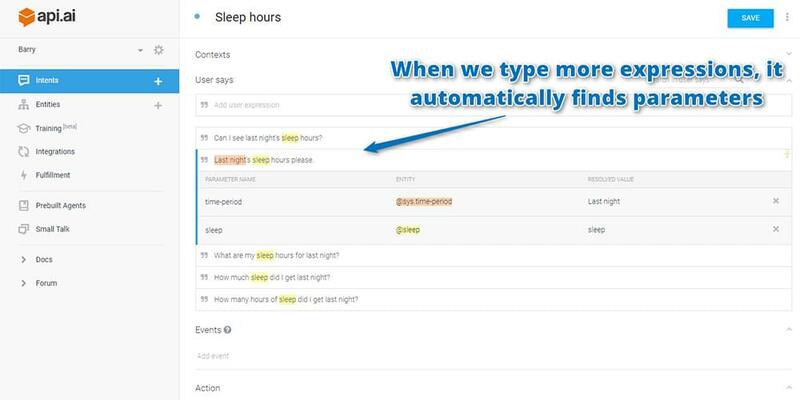 You now need to create a new intent that will train your personal assistant to recognize the sentences that trigger your sleep-related requests. Start by heading to the “Intents” page and creating a new intent as you’ve done a few times by this point in the series. 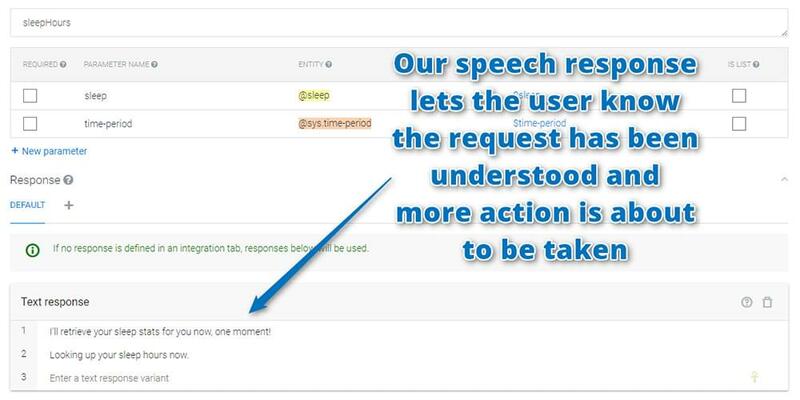 On your new intent page, include your entity within “User Says” statements. 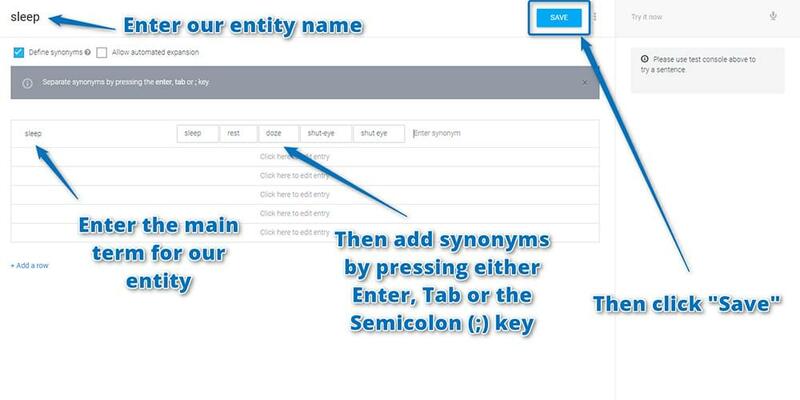 In the case of your sleep entity, enter in a statement that includes a generic word to represent an example of your entity. In this case, type in “How many hours of sleep did I get last night?” Your entity in this case is “sleep”. 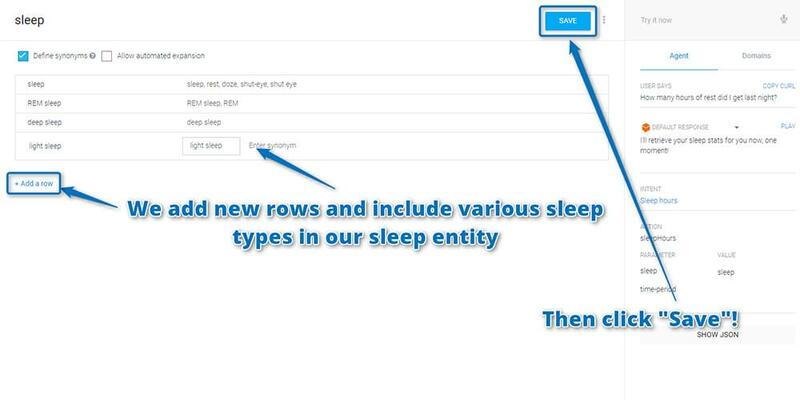 To teach Api.ai that “sleep” is your entity, highlight that word and a dropdown will appear. One of the options should be your new sleep entity — @sleep. Choose that and the word will be highlighted to represent that it can potentially change in statements spoken to your agent. You also have a field for the action name. This is the name that will be passed to your web app to show what Api.ai thinks the user wants to do. Name your action “sleepHours”. To finish up your intent, set up some responses to your intent about sleep hours. The assistant itself in Api.ai can’t look up the stats, so you’ll need to use your own web app for that. However, it’s nice for the assistant to at least keep up the illusion that it’s doing all the work. To do this, your responses say things like “I’ll retrieve your sleep stats for you now, one moment!” and “Looking up your sleep hours now.” It also gives us a bit of time for our web app to retrieve that data. Once you have your responses defined, click Save! 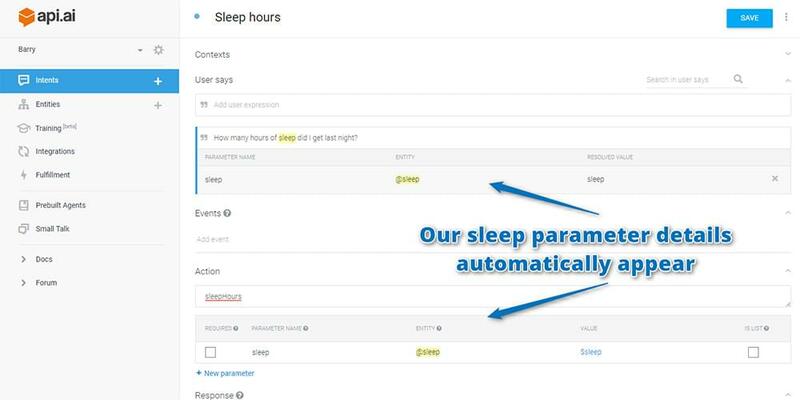 If you test your new intent by saying “How many hours of rest did I get last night?”, your assistant now returns a correct speech response and the action of “sleepHours” ready for your web app to respond. This is exactly what you want! You have a working entity that lets your assistant understand when you want to look up how many hours of rest you’ve had, but the entity is still quite simple. Sleep is just sleep. Rest. Shut-eye. In reality, there are specific types of sleep that a user might ask about. 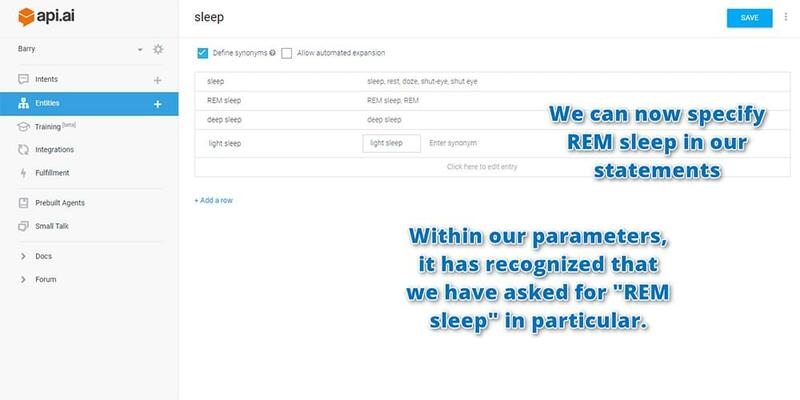 What if the user asks “How many hours of REM sleep did I get last night?” “REM sleep”, “Deep sleep” and “Light sleep” are all different types of “sleep” that should be understood by your sleep entity. You’ll add those in. "intentName": "How many hours of @sleep:sleep did I get last night?" "speech": "Looking up your sleep hours now." This is what you’ll use in your next article to build up your web app’s response to these queries. Incredibly, after three articles looking into Api.ai, you’ve still just scratched the surface of what’s possible with the platform! Entities can contain other entities (both system entities and your own developer entities), you can set up intents that require certain information and prompt the user if they don’t provide it, you can use your previously mentioned entities in a conversation using their $alias … and so on! In the final article in the series, you’ll look at adding functionality to the web app that you created in the earlier article on How to Build Your Own AI Assistant Using Api.ai that pulls in Jawbone data to give you real answers to these queries! I’ve had feedback from a few readers who have been loving building their own personal assistants. If you’ve been following along, how’s your assistant going? What have you trained them to do? Let me know in the comments below, or get in touch with me on Twitter at @thatpatrickguy. I always love to hear the ideas that emerging tech spurs into developer minds!